It's that time of year when sitting on the deck and having a nice long relaxing chat seems like the thing to do. Of course I have a three year old, so sitting still is pretty much not in the picture. And having a whole conversation outside of work hours hasn't happened in well.... three years! Of course I wouldn't change it for anything, but it does make the nice drink and catching up with friends sound that much more intriguing. But quiet afternoon on the deck or not, this sangria is still festive, still refreshing and still worth making. I whipped up a batch on Father's Day. Matt grilled himself a full pound of T-bone steak, so he didn't mind a little fruit floating in his wine. Jax loved having the strawberry garnish. He got his own glass with berries floating in apple juice. He kept telling me how fancy his glass was with the berry. He asked for a fancy glass on his next day too. We all enjoyed it and someday we will get to have that leisurely afternoon sipping wine. In the mean time we'll just have fun making our fancy glasses when the opportunity strikes! Stir together white wine and triple sec. Add a little simple syrup and test it until you get it to the level of sweetness you like. Add berries and refrigerate for at least a couple of hours, even longer if you can wait! Enjoy cold and in a fancy glass! You're speaking my cocktail language here woman. And the fresh berries make it even better!! Ha! Mine too! I might have had them a couple of times already this week! Thanks, Andrea! We really don't have wine all that often either. Matt is more of a Bud Light kind of guy and I just don't drink that often. But every once in a while we like a little wine. This was perfectly refreshing for this heat wave we've been having and a nice something to take the edge off what has been a really long work week! I hope you guys love it! 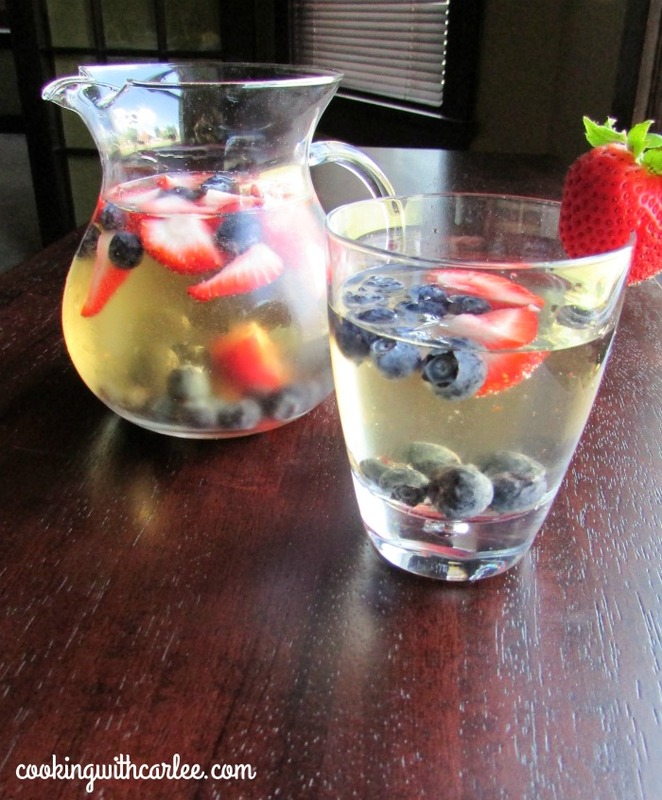 Yum, sangria is wonderful and this looks so light and refreshing. 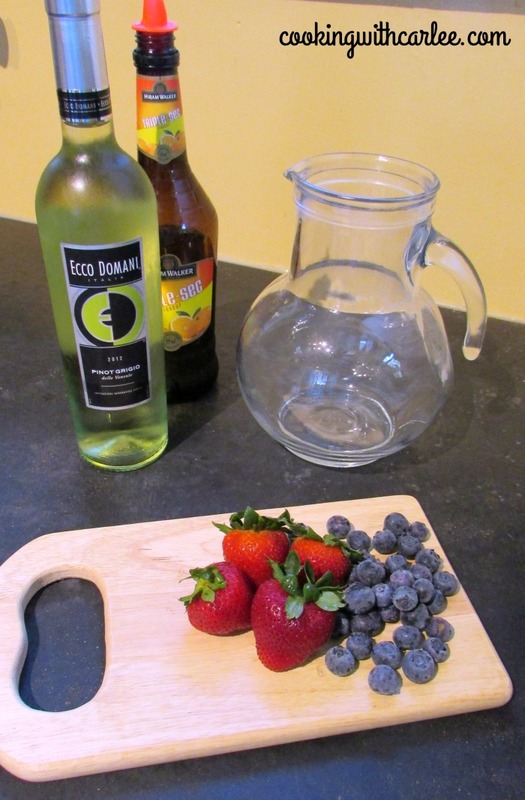 By the way, that Ecco Domani pinot grigio is one of my favs! Isn't it delicious? It was so refreshing as a sangria too, thanks! Love this beverage C! 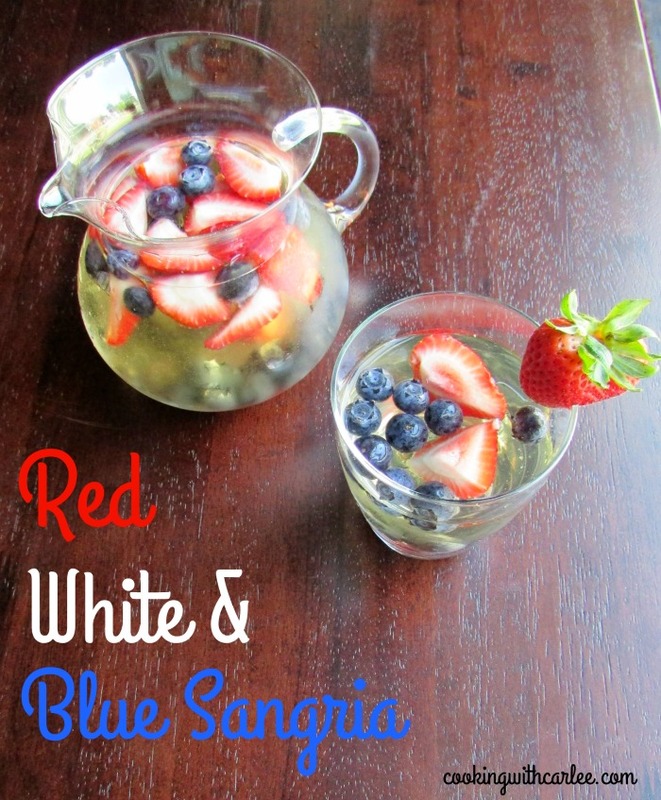 You know I'll be making a pitcher of these for the deck this summer! Thanks for linking up at #HappinessIsHomemade this week! I hope you love it, Katie! Hi Carlee! Just dropping by to let you know I made this Sangria today and it was spot on! We loved it and I'll be featuring it over at You Link It, We Make It tomorrow! Hope to see you back again to party ;)! Hooray! I am glad you liked it! Thanks so much and I'll see you at the party! I don't drink at all, but I have friends that would love this! It would be lovely at a party! So glad you shared it at our Celebrate 365 Blog Party, Carlee! This is definitely a great recipe to save off. Thanks!!! What a great idea! I'm pinning this one!